The future of travel shows no signs of slowing down, with people around the world optimistic about making more travel plans this year, data from a new study shows. 'Travel is like fashion. There are slight variations every season –such as destination and style – but in essence, people are always going to travel, just like they are always going to shop,' says Visa’s Global Travel Intentions Study. It says travel trends to keep a watch in 2016 include an increase in people venturing out on their own, and an increasingly blurred line between work and play. 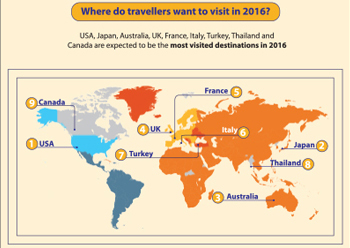 General travellers are likely to take an average of three international trips in 2016 while affluent travellers have revealed that they plan to take an average of five international trips this year. It predicts the highest increase in outbound leisure travel for the year will come from Egypt (over 54 per cent), Morocco (43 per cent), South Africa (30 per cent), China (22 per cent) and Kuwait (14 per cent) with the most visited destinations expected to be the US, Japan, Australia, UK, France, Italy, Turkey, Thailand and Canada. While leisure takes the top spot for reasons to travel, the lines between work and play seem to be blurring with 16 per cent of travellers having combined leisure and business on overseas trips in 2015, spending an average of 10 nights on their trip. Moreover, three out of four ‘bleasure’ travellers are influenced by the ability to collect and redeem frequent flyer miles when choosing their destination, data revealed. The top five activities travellers engage in while at their destination are shopping, visiting famous locales, visiting restaurants, taking part in local nightlife and visiting religious monuments, it says. Spontaneous travel has tremendously picked up, with the percentage of travellers planning their holiday a month or less in advance jumping from 41 per cent in 2013 to 53 per cent in 2015. The number of solo travellers have also doubled, with first-time solo travelling moving up from 16 per cent in 2013 to 37 per cent in 2015. One of the key drivers of growth in the travel industry is the ability to access information on mobile devices on the go and Visa’s study shows that more tech-savvy travellers were taking advantage of information at their fingertips. In 2015, 64 per cent of the travellers used a mobile device to access online information before the trip, compared to 42 per cent in 2013. During the trip, 75 per cent of the travellers used mobile devices to access online information in 2015, up from 56 per cent in 2013. Furthermore, payment choices available to travellers has drastically increased and become more secure with more travellers carrying payment cards when vacationing. In 2015, 93 per cent of travellers opted to carry payment cards compared to 77 per cent in 2013 with eight out of 10 travellers using a combination of cards and cash while at their destination. With greater options on offer and increasingly secure electronic payments available, leisure travel is beginning to reach a bigger market than ever before.